It Takes a Village ... Discovery Arts is blessed to have some of the best people on the planet supporting our mission. They work tirelessly to give each child a magnificent day and they are the heart and soul of every Arts Adventure! Heart and Soul do not begin to describe this multi-talented and fun loving lady! What a dream she is to stand by us every step of the way from the very beginning!! 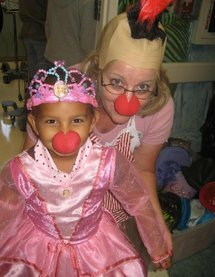 She operates on both left and right sides of the brain and loves all of the children with a heart of pure gold! She counts the beans and makes certain that everything is taken care of and all of the inner workings of Discovery Arts is running smoothly... a big job! Gina is magic. She is a professional dancer and performer and she can also be seen performing at Disneyland! She was made for inspiring children and all of our children LOVE her!! We LOVE her too!! Gina heads up many of our programs and is always there to lend a hand to everything we do. We appreciate everything she does for us and the joy she brings to the children and anyone who has the privilege of knowing her is blessed! Jenn fits in perfectly with Discovery Arts and we are so happy to have her! She is talented and wonderful with the kids and also helps us in the office! She is such a blessing! Jenn has her B.A. in Dance from Loyola Marymount University, and has been in the entertainment industry for over 15 years. She has been a performer in numerous parades and shows throughout the Disneyland Resort. Jenn can also be found on the hit children's television show, Yo Gabba Gabba!, and has performed on the National Tour of Yo Gabba Gabba! LIVE. An unbelievable support to Discovery Arts with a heart of gold that won't quit! She "connects the dots" and serves by writing press releases, handling a very wide range of all of our media, marketing and publicity for our programs and services. She can do anything and loves people and our children. She deeply understands why Discovery Arts is so important and we appreciate her tireless effort to spread the word about Discovery Arts and make wonderful new friends for us. We love her and are so grateful to her! Volunteer, This lovely lady is so sharp and so fast!! She offers the most incredible help, she is on top of everything we do and a GREAT support to us... she designs our email newsletters and flyers along with having jet lightening speed, accuracy and is a tremendous support to us! We think we have encountered just the "tip of the iceberg" with Jhana's talent and her loving spirit and her heart for our children just adds to the pleasure of having her in our DA Family! Volunteer, recipient of the Cindy Fortezzo Memorial Award for outstanding service to Discovery Arts. Larry is a treasure and has served the children of Discovery Arts for many years. He helps us in so many ways... he serves the children at Miller Children's Hospital each and every week, he builds shelves in the office, takes care of our storage unit, builds costume racks, picks up large item donations (carting them up and down our stairs), works in our booths at events and so much more. He is a grandfather and supports all of our efforts and we are very blessed to have him! Volunteer, and she is our Official Photographer! She is a recipient of the Cindy Fortezzo Memorial Award for outstanding service to Discovery Arts. Teresa is a very talented lady who discovered us by accident at CHOC when she had a health scare with her daughter. She has an incredible "eye" and talent with photography and has captured many treasured moments at Discovery Arts. Teresa takes charge of our Discovery Arts "Team" for the run, walk and bike with PCRF and takes care of our volunteers at the Festival of Children event every September. 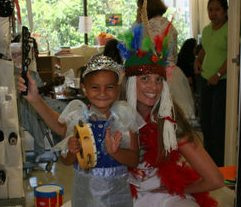 She supports all aspects of Discovery Arts and chances are you can meet her and Larry in one of our many event booths! Jeff's amazing talent, huge heart, his natural understanding of the kids and an all around funny, happy guy..... He designed the look and feel of Discovery Arts including but not limited to: it's Brand, Logo, Flyers, Cards, Signs, Marketing Materials and much more. He has his heart all over Discovery Arts and we are forever grateful to him. Our Brother Jeff has been with us since day one... he was a long time volunteer and massive support to Discovery Arts who invested countess hours of love. Jeff was the owner and Creative Director of The Stampede; a multi-talented group of industry artists that create theme park environments, movie props, and effects along with architectural accents for construction and restoration. In his off season he taught and mentored art students in his local Universities.